The Rebel County were relegated before throw-in following Clare’s win over Tipperary earlier on Sunday. 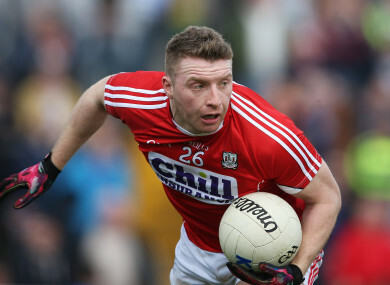 Brian Hurley scored two goals for Cork on Sunday against Armagh. CORK PLAYED THEIR hearts out, but Clare’s win in Tipp meant the trap-door still opened big and wide to sent the Rebels crashing down to Division Three for the first time in their history. This was a much-improved display from Cork, in front of 3,425 in the Athletic Grounds, but poor results earlier in the campaign left them in a helpless position where their fate was not in their own hands. Armagh, already safe in Division Two, had little to play for and it certainly looked like that in a sluggish opening half from them. Cork were good value for their 2-6 to 0-6 half-time lead with two early goals from Brian Hurley the highlights of a whirlwind start when they hit an unanswered 2-3 in an eight-minute spell. Even when Armagh drew level for the first and only time in the game through Rory Grugan’s free in the 67th minute, Cork kicked on with late points from subs Cian Kiely and Damien Gore to clinch a hollow victory. Hurley’s first goal came in the fourth minute. He cut in along the sideline, exchanged quick passes with Mark Collins before burying the ball low to the far corner. Cork found a lot of joy cutting Armagh open clean through the middle and Eoghan McSweeney (two), Cillian O’Hanlon and Mark Collins stroked over lovely points with the wind at their backs. Armagh lost Niall Grimley to a black card for a foot trip in first-half stoppage time, but going down to 14 players didn’t unsettle them in the early stages of the second period. They outscored Cork by six points to one in the third quarter with Rian O’Neill, Jamie Clarke and James Morgan all brought off the bench to inject more urgency into Armagh. O’Neill landed a free and a mark with two Grugan frees and a fisted Joe McElroy point making things interesting with Cork only scoring one point in the first 26 minutes of the second half. Instantly, Armagh responded with a raiding attack and McElroy was fouled in the square, with Jamie Clarke stepping up to bury the ball low inside White’s left-hand post. Grugan’s free brought Armagh level, but Cork rallied with the late points to win the battle, but it was too little too late for their Division Two league hopes. Email “Cork come crashing down to Division 3 for the first time despite one-point victory in Armagh”. Feedback on “Cork come crashing down to Division 3 for the first time despite one-point victory in Armagh”.